Further to the pre-consultation that happened on 17 March, there is another opportunity to view updated plans at the venues below. Please take time to look at our previous post giving you background details on the site. You can view the Presentation boards from the drop-in session and further plans below. Please note that the plans are work-in-progress and may be amended before the planning application is submitted, which is due to be mid to late July 2015. Once submitted, you will be able to view all plans and formally submit your comments on the proposal. We will provide the planning application number when available. Demand for school spaces has increased dramatically in all areas of the Borough in recent years and there is a consistent anticipated shortfall in places. Proposed new housing on the Felnex site, along with other pressures in the Hackbridge area, means that there is a requirement for a new two form entry primary school. 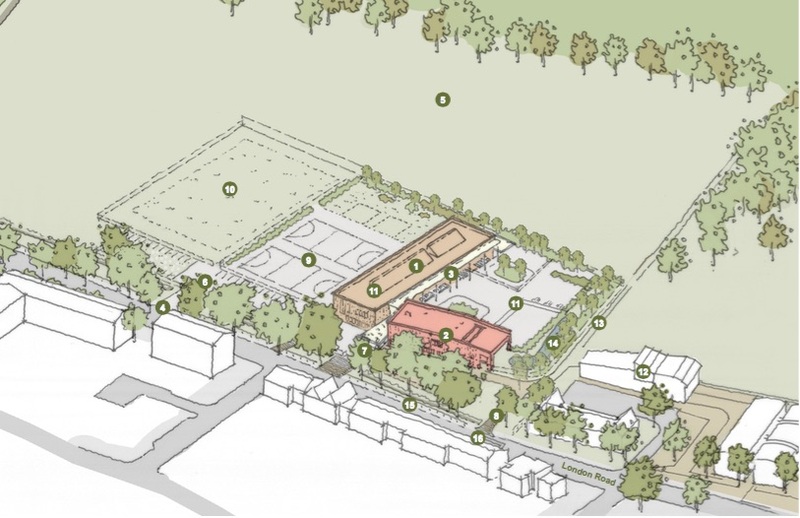 Architype has been appointed by the London Borough of Sutton to develop proposals for the provision of a new Primary School on the Metropolitan Open Land (MOL) site immediately to the north of the BedZED development. The school will provide space for 420 pupils aged 5-11. It will be a highly sustainable environment to learn in, and an environment to learn from. It will be energy efficient, be constructed of materials that are healthy and have low embodied energy and be easy to construct and maintain. The internal environment will be developed to maximise natural daylighting and fresh air provision. The school will integrate learning about sustainability by growing food, supporting active travel, reducing energy and waste and providing well-designed environments for outdoor learning and play. The school will be Zero Carbon and Passivhaus certified. The site is zoned Metropolitan Open Land (MOL) but the GLA have given their support to use of the MOL for a new school. The proposals provide a comprehensive masterplan for the southern section of the site. The site of the school is divided into 3 zones. A community zone comprising of the main entrance, hall, kitchen, administrative facilities, drop off and deliveries. The habitat area is adjacent to the existing BedZED pavilion. This provides additional community provision and a marker to the start of the cycle/foot path to the proposed Eco Park. The North wing is the learning zone, comprising the main teaching accommodation and associated external covered play. To the north of the building is the main external hard and soft teaching and play spaces in a secure perimeter. The rest of the MOL will remain open, to become an Eco Park that both the school and community could benefit from. The scheme is designed to be carbon zero which is befitting of its location next to the Bedzed project and also Sutton’s One Planet Living aspirations. To achieve carbon zero requires a rigorous approach first to reducing energy consumption and then a robust strategy for implementing enough Low to Zero Carbon technologies (LZCs) to provide a net energy zero school. Architype have achieved the first aim on previous schools by designing to the Passivhaus standard. This has proven to have an exceptional track record of reducing energy consumption in Europe and now in the UK too. A typical school consumes 269 kWh/a.m2 Primary Energy (CIBSE TM- 46) and a Passivhaus School, to achieve certification, must consume less than 120 kWh/m2.a Primary Energy. The resultant energy saving is 55%. In Germany Passivhaus schools have achieved savings in excess of 75%. Once energy consumption is reduced, achieving a net energy zero building becomes more realistic through the use of on site renewables. In this instance, we propose to achieve this through high efficiency solar PVs and a heat pump system with the potential for inter-seasonal storage. Off site renewables are not required. We are currently targeting a significant energy positive building. Previous Hackbridge is expanding ….